To protect the health and safety of animals by providing charitable assistance in our no-kill shelter for all animals. We will be the over-flow for all City and County shelters, while assisting traditional rescues with medical and foster programs. Bestow daily care, rehabilitate homeless, displaced, or injured animals; to find such animals’ good homes; and to educate the public as to how to bring about a time when the shelters are only empty cages and unwanted animals will never be destroyed needlessly. FUR & FEATHER ANIMAL SANCTUARY a 501(c)(3) is organized exclusively for charitable, and educational purposes, more specifically for helping homeless and un-wanted animals with medical care, adoption in a no-kill safe environment, fight against animal cruelty, educate the public on the importance of spay/neuter, the basic care of animals, and the rehabilitation of wildlife. We have only just begun and need your support - Our goal is to build the first fully solar powered 65 acre no-kill sanctuary in California to be the over-flow for the city and county shelters, while assisting traditional rescues with medical and a foster program. 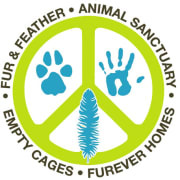 FUR & FEATHER ANIMAL SANCTUARY accepts donations. Donate Now. Would you recommend FUR & FEATHER ANIMAL SANCTUARY?